I heard that they are usually full during lunch and dinner, so we went there during mid afternoon and we had the whole cafe to ourselves. If it was the ‘old’ me, I’d have rejected the idea of savoury pancakes: “how can pancakes be savoury, they are supposed to be sweet, they are dessert!” But hey, there’s always a first time for everything, right? After settling down on the cosy sofa, I took a look at Strictly Pancakes’ menu and went for the Snuggle Up ($13). Tasty hotdogs held within the fluffy pancakes, drizzled with the sweet maple syrup and butter; perfect! Who can refuse a hot and puffy pancake? Not me. We felt that the mushy peas didn’t really blend in well with the pancakes and sausages, but it was a good attempt anyway. Eeew, pancakes and GARLIC BUTTERED PRAWNS? Yes. The stack of pancakes were served together with prawns buttered generously with garlic. To be fair, it wasn’t as weird as we thought. The Garlic Buttered prawns pancakes ($14) that silvia ordered were actually pretty tasty. Here’s a tip: if you are a savoury person, by all means order the savoury pancakes like the Beef Patty, Chicken chunks, and Smoked Salmon from Strictly Pancakes. But for those who have a sweet tooth and find it hard to accept the idea of a savoury pancake, I will still suggest you to give it a try. Think of it this way, if worse comes to worst, you can always have the savoury toppings separately, and finish the pancakes with maple syrup and butter as dessert. Give them a try with an open mind, there’s really nothing to lose. The Strawberries & Co ($10) is a medium stack of pancakes with mixed berries, strawberries coulis, and vanilla ice cream. Whenever I go to Epicurious Cafe for breakfast, I’ll always order their pancakes as it is affordable and good. But after having the ones from Strictly Pancakes, I will go as far to say that they have the best pancakes in Singapore. Three fluffy and thick pancakes with a scoop of good vanilla ice cream for just ten bucks – how do you beat that? Having pancakes is just an excuse for me to eat maple syrup, and ice cream. We also had the Bananas-Scotched ($10). The pancakes were the perfect vehicle to soak up the rum and maple syrup, together with the caramelised bananas and vanilla bean ice cream — I think I am in sugar heaven. Mind you, this is extremely sweet, so only order it if you have a high tolerance for sweet stuff. The pancakes are definitely substantial enough for lunch, we were so full that we couldn’t finish all the pancakes. For those of you who are keen to try the Prinsep Street Pancakes, I’d advise you to share the pancakes (for 4 person, 3 different pancakes should suffice). Strictly Pancakes reminds me of Hatched and Wild Honey, which serve all day breakfast daily. Now you can have your pancakes during breakfast, afternoon tea, or as desserts after dinner. There’s no doubt. I definitely will come back to Strictly Pancakes at Prinsep Street to satisfy my pancakes craving. 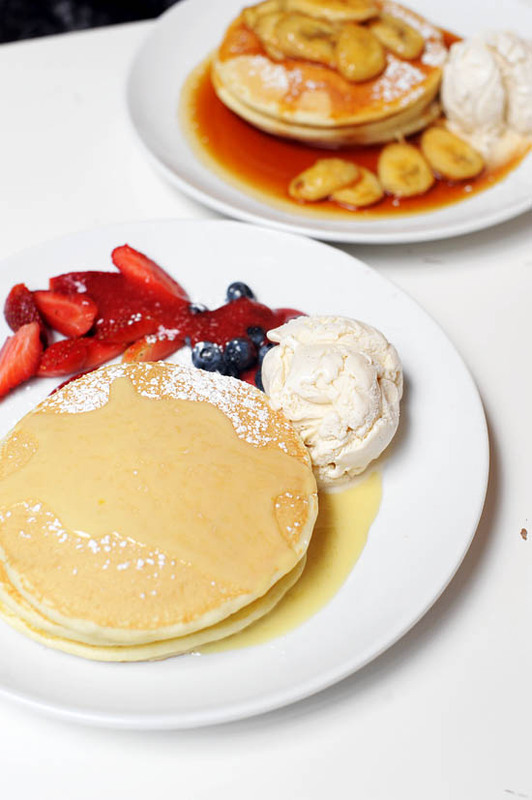 Strictly Pancakes has the best pancakes in Singapore, it’s time to drop by for a pancake party! Hmmm… I am not sure about “best pancakes in Singapore” but I do agree that Strictly Pancakes has a very unique concept of its menu. It’s super cozy there too. I enjoyed the chocolate pancakes that I tried at POTR in Sydney. Did you enjoy them too? you took incredibly beautiful pictures!!! Just tried the caramelized banana pancake at Canele last Sunday. It’s the BEST pancake I’ve had in a while! Definitely worth a visit! Are they stingy with their maple syrup? My gripe with Wild Honey is that they are super stingy with that – the person gave me an irritated look when I asked for an extra serving of their already-very-small serving of maple syrup. Pancakes taste best when flooded with maple syrup! why are your reviews always so flattering? it’s like you never have a bad word to say about any place that you go to. strictly pancakes is just plain ol pancakes — even the betty crocker buttermilk mix or the bisquick one would probably taste just as good, and for a much cheaper price. they do have some interesting items, but i think it probably isnt worth it, and it certainly isnt the best pancakes in singapore. there was a cafe in cambridge that sells waffles with savoury dishes too, like waffles w ratoutille or green curry or mushroom ragout etc. they were yummy! Never thought about savory pancakes before and I sure would like to try them! really disappointed that you put strictly pancakes as “the best in singapore” =\ especially coz i’ve been trusting your recommendations thus far! pancakes at barracks and prive are really good though! the pancakes wasn’t as nice as I thought it would be! The pancakes served was cold and their smoked salmon taste weird too. These look horrible!! Why don’t they have any colour! I agree with some of your readers. Strictly pancakes is nowhere near the best pancakes in singapore. They taste exactly like hotcakes from Macdonalds, if not worst. And also pricey for the average-standard they offer! Have never went back there ever since a year ago when I first tried it. i heard the service there is super bad, thats why i never got round to trying. like they insist on serving the savory and sweet pancakes together cos its a “company policy”. the bosses also apparently have no qualms scolding customers. Definitely disagree. Their pancake to sauce ratio leaves much to be desired. And restaurant operations is poorly designed. And it’s certainly not the first of its kind in Singapore. We had Better Batter for many many years, although sadly it has closed down. My fren n i was there on Sat. And totally regretted goin over. The pancakes was tough and little sour on da taste. they gv same amt of butter and syrup for short and medium stack. And charge xtra for butter! Really mcdonalds pancake is lot better and it will really help the situation if they at least smile. I too, disagree Strictly Pancakes being the BEST ones in Singapore. I had it today and it tasted ordinary, not any better than Macdonalds pancakes, though much more thicker.Their Weekend breakfast set comes with 3 pieces of pancake in a stack and at the second piece, it felt like a chore to finish up the rest… The ambience wasn’t that great either, I believe they were trying to maximise revenue per space. The tables were all very close to each other and I had to squeeze through a small gap to get to my seat by the wall. As the small enclosed place on the second floor gets flooded with more ppl, it gets even nosier – everyone starts chatting on top of their voices to be heard. ughh… Brunch costed us $30+ for 2 pax. Imo,i feel that Macdonalds’ more satisfying. I have had pancakes at different places across the world… but you are right, the idea of savory pancakes is indeed delightful!